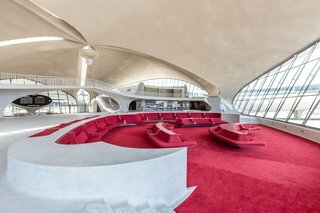 An abandoned airport terminal at New York’s John F. Kennedy International Airport has been reborn as the TWA Hotel, a stylish stay channeling the jet age. 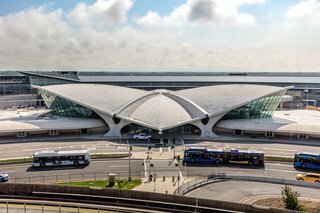 While the once-groundbreaking Trans World Airlines ceased operations in 2001, and the terminal closed in October of that year, the luxe hotel pays homage to the original architecture of the 1962 building designed by architect Eero Saarinen. 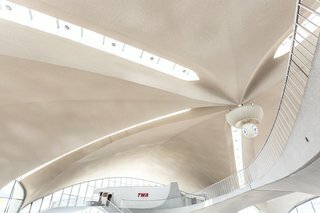 The entryway to TWA Hotel. 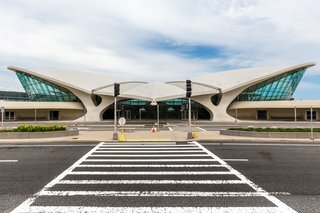 This 1962 Eero Saarinen-designed landmark now holds the TWA Hotel. 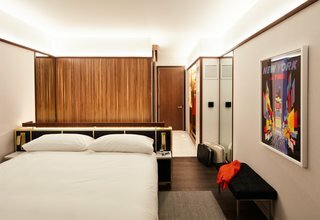 The hotel, which begins accepting reservations on February 14, has been reimagined by New York–based design firms Lubrano Ciavarra, INC., Beyer Blinder Belle, and Stonehill Taylor. The project calls to mind the romance of flying when the transportation method was still a novelty. Some original waiting area seating remains in the lobby and the business and events center. This space was originally outfitted by acclaimed Parisian industrial designer Raymond Loewy, the mind behind the 1955 Coca-Cola contour bottle, the 1959 TWA twin globes logo, the 1963 Studebaker Avanti, and the 1962 Air Force One livery. Vintage tunes drift through the hotel in a curated soundtrack featuring Frank Sinatra, The Beatles, The 5th Dimension, Dusty Springfield, Rosemary Clooney, and Dean Martin. Airline beverage carts with snacks and carbonated sips are speckled throughout the grounds, while a champagne fridge filled with Moet & Chandon, TAB, and miniature bottles sits at the ready in the lobby for a boozy fix. 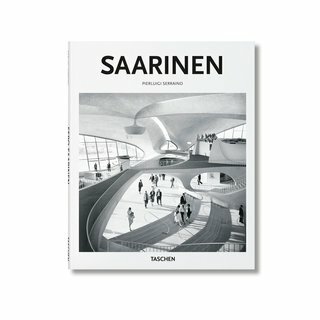 Chili Pepper red is the signature color created by Saarinen for the TWA Flight Center. The hue also inspired Benjamin Moore’s 2018 color of the year, Caliente. To access the guest rooms, patrons enter through space-age flight tubes—which you may remember from the film Catch Me If You Can. 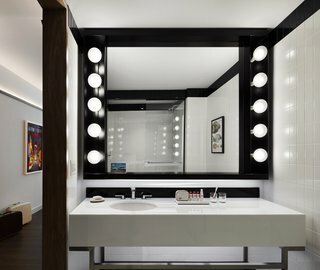 Clean lines meet a touch of glam in the rooms, which feature leather upholstery; a pop of primary color; Hollywood-style vanities; and custom walnut, brass, and glass details. 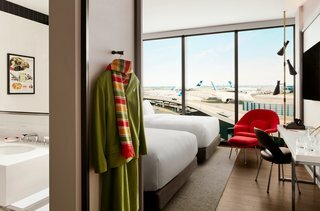 Guests can make free unlimited local and international calls from a rewired vintage rotary phone, while taking in views of the runway. Guest rooms at the TWA Hotel have the second-thickest glass in the world. 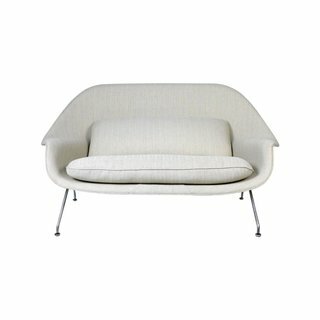 Eero Saarinen arrived at the concept for his 1948 Womb Chair when challenged by Florence Knoll to design a chair of supreme comfort - one she could really “curl up in”. 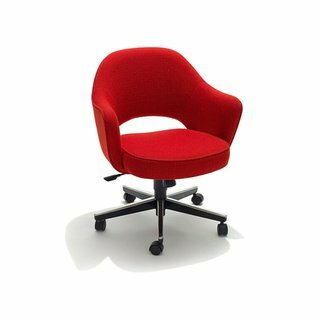 The Saarinen Executive Armchair with Swivel Base from Knoll is an armchair that achieves supreme comfort by way of its unique form and multi-layered cushioning system. No need to worry about jet engine noise, as the floor-to-ceiling windows are built with Fabbrica glass—and they're the second-thickest windows in the world, following those of the U.S. Embassy in London. A fully stocked, in-room wet bar holds Moët & Chandon Imperial Brut Champagne, Hennessy V.S.O.P Privilège Cognac, and ingredients for making the official 007 Belvedere martini for when you get thirsty. The hotel features custom-built millwork crafted in Ohio’s Amish Country—including walnut martini bars and tambour walls, as seen here. All specialty pieces are created from locally grown walnut trees. 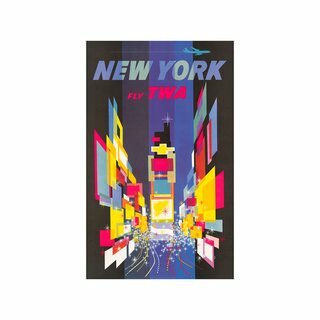 The museum showcases a collection of authentic TWA air hostess uniforms designed by Valentino, Ralph Lauren, and Stan Herman. Common area amenities include 50,000 square feet of event space for up to 1,600 people, a 10,000-square-foot fitness center offering yoga and spin classes, eight bars, and six restaurants including acclaimed chef Jean-Georges Vongerichten’s Paris Café, Lisbon Lounge, and the revived Ambassador’s Club. The eateries will serve travel-inspired fare from a multitude of destinations, like French marchand de vin braised beef, pasta from Italy, and barbecue chicken from the U.S. 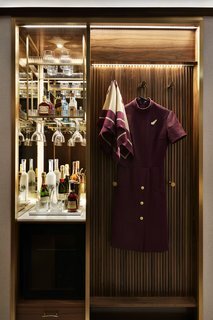 There are also high-end retail outlets, an Intelligentsia coffee bar and carts, and a cocktail lounge housed within a Lockheed Constellation L-1649A airplane. The design team refurbished a classic Solari split-flap message board (with authentic original mechanical operation) manufactured in Udine, Italy. 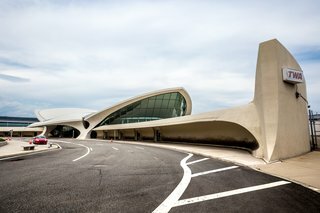 A hotel museum dedicated to TWA chronicles the midcentury modern design movement and the rise of the Jet Age. 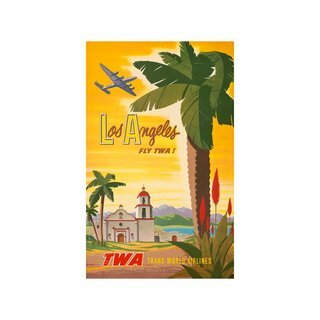 Various artifacts will be on display, including midcentury furniture, David Klein destination posters, vintage luggage tags, TWA uniforms (including the "jungle green" suit worn by air hostesses circa 1968 to 1971), and a TWA toiletries kit—which is also available in each of the guest rooms. Every bathroom comes equipped with a TWA toiletries kit. "Restoring the TWA Hotel is a labor of love for our entire team," says Tyler Morse, CEO of MCR and MORSE Development. "We are counting down the days until the landmark building, dark since 2001, is filled with life again." 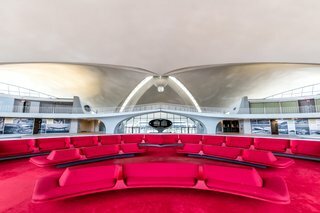 Curved seating banquettes and Eero Saarinen-designed penny tile flooring make up the main common areas. 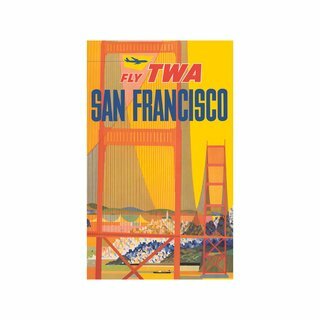 Graphic, gold-washed, vibrant, and vivacious, this vintage airline ad sums up its destination with classic allusions to some of the most commonly recognizable colors, textures and locales. Come May 15th, the hotel will welcome travelers for long- or short-term stays—even just for a quick place to shower, catch up on emails, get in a bit of exercise, and nosh on gourmet eats before heading to the next stop. 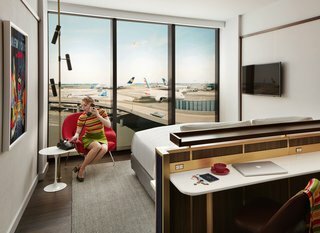 Reservations for the TWA Hotel open at noon EST on February 14, with room rates starting at $249. TWA Hotel celebrates its history with vintage uniforms on display. Pictured here is a Stan Herman flight attendant pantsuit from 1975. An aerial view of TWA Hotel.